Baseball is saying goodbye to its four-pitch intentional walk—and antics of an intent ball gone wrong—in favor of pace-of-play-friendly dugout signals, according to several sources. Manfred previously stated "that there really won't be any meaningful change for the 2017 season due to a lack of cooperation from the MLBPA," while player's union head Tony Clark wrote, "fundamental changes to the game are going to be an uphill battle." However, the apparently less fundamental four-pitch intentional walk (as opposed to the more fundamental strike zone issue) appears headed for extinction. 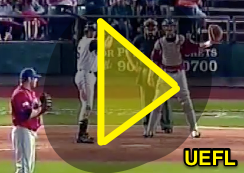 Say goodbye to intentional walk-off disasters. Intentional balls don't often go awry, but when they do, the results can be memorable. 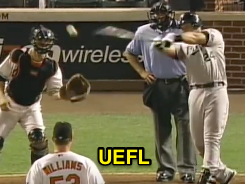 When Baltimore pitcher Todd Williams attempted to intentionally walk Marlins slugger Miguel Cabrera in the 10th inning of a tied game on June 22, 2006, Cabrera hit the first pitch he saw for an RBI single, scoring Florida's game-winning run. In 2014, Dodgers relief pitcher Chris Withdrew attempted to intentionally walk Diamondbacks batter Martin Prado in the top of the 9th inning of a 1-1 game. After all, with one out and a runner on third, setting up a potential inning-ending double play is a plausibly good strategy...except that Withrow's 2-0 pitch to Prado sailed over catcher Tim Federowicz's glove, allowing D-Backs baserunner R3 Tony Campana to score the go-ahead run for Arizona, which eventually won the contest, 4-2. A similar wild pitch-during-an-intentional-walk mishap occurred in Tampa Bay (run scored)...and in Detroit...and in San Francisco...and in Anaheim (run scored)...and in Oakland...and in Detroit (again)...and in Detroit (for a third time, with a run scoring)...and in Seattle (run scored). 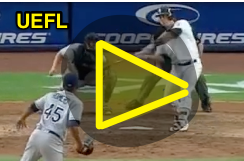 Most recently—and perhaps the last instance of a flubbed intentional walk MLB will ever see—Yankees batter Gary Sanchez hit a sacrifice fly when Rays pitcher Enny Romero's intentional ball flew too close to home plate and within the reach of Sanchez's bat. Sanchez's IBB sacrifice could be MLB's last. In a similar vein, Lancaster Barnstormers pitcher Lance Odom unintentionally spurred a walk-off win for opposing Somerset in 2007 when Odom's intentional ball with a runner on third in extra innings sailed over the catcher's head, allowing baserunner R3 Danny Garcia to score the game-winner from third base. A similar fate befell Auburn in college baseball during a poorly placed intentional ball at Ole Miss that was swung on and hammered into the outfield seats for a walk-off home run. Intentional walk mishaps at the lower levels have also produced a steal of home, and even a catcher's balk. Say goodbye to those, too. There were just 932 intentional walks given out across the majors in 2016, which averages out to one for every 2.6 games played. By contrast, 2016 featured 1,468 regular season Replay Reviews, or one every 1.7 games. Intentional walks averaged less than one minute each while Replay Reviews took an average of one-minute and 36 seconds to complete. MLB has also purportedly proposed a 30-second time limit on Replay Reviews. This latest intentional walk news comes just weeks after baseball's most recent proposition to the players' union concerning free passes, and just two years after MLB tested no-pitch intentional walks during the 2014 Arizona Fall League. In reportedly adopting the no-pitch intentional walk for regular season play, MLB hopes to reduce game times and increased pitch counts (presumably, by four pitches per occurrence), while collaterally eliminating the aforementioned possibility for an intentional ball-gone-wrong by way of a balk, wild pitch or pass ball, batter's swing at an intentional ball, and stolen base.